From fibreglass propane bottles to shrinkable extension ladders, here are innovations for your RVing lifestyle. The recent Recreation Vehicle Dealers Association (RVDA) show in Edmonton was a great place to check out new RVs, aftermarket accessories and the latest innovations. 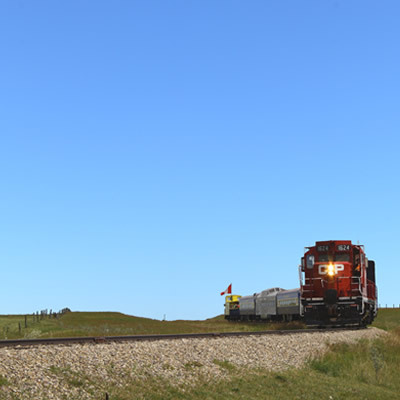 Here are some of the interesting innovations at this year’s RVDA RV Expo & Sale in Edmonton. 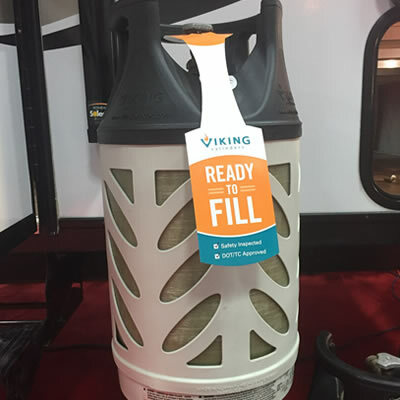 Viking composite propane tanks have been around since 1996, but the first ones I’ve ever seen were at this year’s RVDA show. The tanks are noticeably lighter compared to a standard tank—about half the weight of comparable steel. You can see the level of propane through the translucent tank wall, so you won’t have to guess how much propane is left. Viking propane cylinders are made in Norway by Hexagon Ragasco and its website says 10 million composite pressure cylinders have been sold. “Viking tanks are a suitable tank for anyone with any type of use for propane. Their light weight, durability and safety make them a great choice for everyone, from the lonesome camper to the ones that would only use it for their deck barbecue,” said Shaleigh Lovich of ArrKann RV. Is the weight reduction worth the price? You will have to decide, but they are surprisingly light and come in cool colours. Did you know you can rent winter cabins at the Alberta Parks Sir Winston Churchill Campground near Lac la Biche? What a fine base location for an ice fishing trip. In fact, there are comfort camping cabins, huts, canvas tents, tipis and yurts available at select campgrounds throughout the province. You can rent huts and cabins at Cypress Hills; yurts at Miquelon and Pigeon Lake; and canvas wall tents at Writing-on-Stone, Dinosaur and Wyndham Carseland parks. There is a lodge at Lesser Slave Lake that sleeps 10 and tipis at Sir Winston Churchill Provincial Park on Lac la Biche. Search “Comfort Camping” on the Alberta Parks website to find these alternative accommodations. The website describes each of the locations where comfort camping is available. Under each listing you can find specifics about each site, utensils and equipment that are provided, and what you should bring yourself (campers are required to bring their own bedding) as well as any special access requirements. The information spells out directions regarding drinking water, toilets and grey water disposal. Check availability and make reservations here. Need a ladder to access your RV or motorhome roof for inspection or to tie down your Kevlar canoe? Red Fern Enterprises markets a telescoping ladder that works well for RVers. 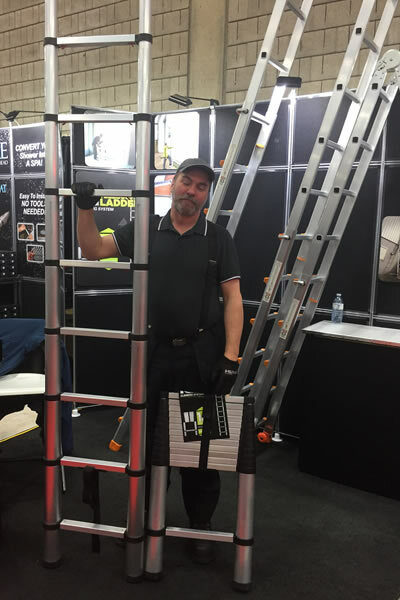 Dan Gauthier of Red Fern Enterprises said two popular models are the 12-foot (3.7-metre) extension ladder and the eight-foot (2.5-metre) A-frame ladder that flips open, transforming to a 16-feet (5.9-metre) extension ladder. Both are type No. 1 ladders with a 150-kilogram (330-pound) weight limit. To collapse the extendable ladder to its three-foot (one-metre) storage height, just flip a lever. The air trapped inside the ladder releases and retracts the ladder. 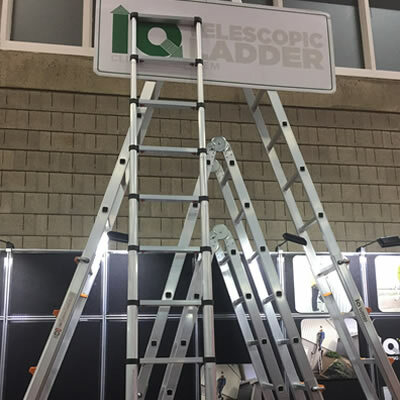 “Red Fern Enterprises offers ladders for sale at home shows, and boat and RV shows as well as some of the bigger exhibitions during the summer. It is best to call Redfern Enterprises (1-877-387-7770) to find out the next local show to get the discounts,” said Gauthier. Need an insurance quote for your new RV? How about snapping a photo of your driver’s licence and the Vehicle Identification Number (VIN) from your vehicle to get a firm insurance quote? Would you call this innovation? 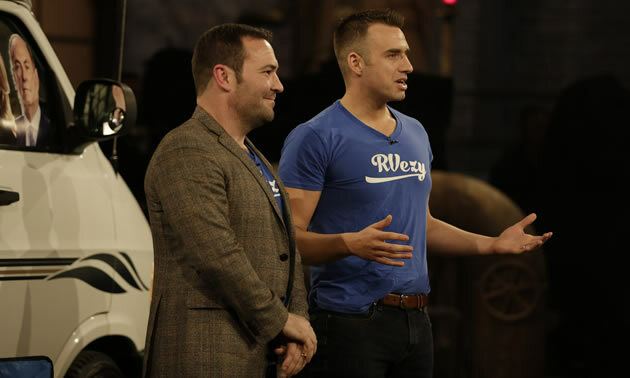 Michael McNaught, a recent successful competitor on Dragons’ Den and founder of RVezy, provides RV owners the opportunity to list and rent their recreation vehicle for income. Camper-customers use the RVezy platform to access RVs for short-term rentals. McNaught’s biggest challenge was arranging insurance for short-term RV rentals. Now with the insurance issue solved, RVezy is available Canada-wide. If you are familiar with Vacation Rentals By Owners (VRBO), HomeAway and Airbnb, you already understand the rental concept of the sharing economy. Turo is the equivalent arrangement for motor vehicles. Owners rent their property to guests on a short-term basis, generating income from their property while prospective guests get access to multiple alternatives for accommodation. The success of these arrangements demonstrates how people have embraced the sharing economy. RVezy is the same concept. The spirit of innovation drives people to fiddle with things, to solve problems, to ask “what if?” Each of these innovations is the result of thoughtful people tackling real problems and opportunities and then noodling solutions. Has life on the road been hard on your shades? 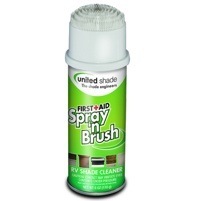 United Shade Spray ‘n Brush can help you take care of your shades. 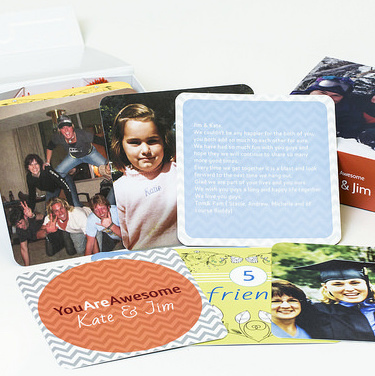 A fun, unique gift idea that can be created and added to by a group of friends.